Northern Virginia is home to numerous active duty, retired, and veteran service members and their families. Funerals provide an opportunity to pay homage to a veteran’s military service by acknowledging their service and sacrifice to our nation. 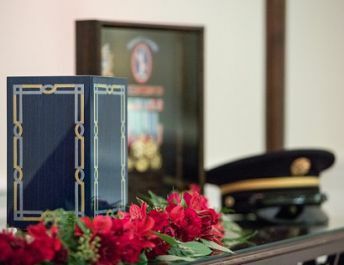 The tribute may be as simple as creating a memory table to display military medals, photographs or an American Flag or as involved as scheduling a full military honors funeral services at a National Cemetery. Our funeral directors will guide you through your options to ensure that your loved one’s military service is honored in a meaningful way. The Veterans Administration operates 131 National Cemeteries across the united states. Arlington National Cemetery, Quantico National Cemetery, and Culpeper National Cemetery are three common choices for Northern Virginia families wishing to inter or inurn their loved ones in a national cemetery. If a National Cemetery located outside of Northern Virginia is selected, your funeral director will coordinate the services with the cemetery, local military resources, and a local funeral home, if necessary. Spouses of military veterans and, in most instances, dependent children are eligible for burial or inurnment in a Veteran Cemetery. The funeral home will need a copy of the veteran’s separation documents in order to schedule services with the cemetery. Military spouses do not qualify for military honors or a military funeral flag. However, at Arlington National Cemetery, dependents eligible for burial will receive assistance from the branch of service of the qualifying veteran in the form of a casket team to act as pall bearers and a military chaplain. Families who choose to have their loved ones buried at Arlington National Cemetery are experiencing significant delays. The current approximate wait time to for services at Arlington National Cemetery is two to five months from the date of death. After the immediate services have been completed, your loved one will be transferred to the Hall of Heroes. The Hall of Heroes is a segregated (used only for veterans and their dependents), climate‒controlled area where the deceased will be cared for until services are held at Arlington National Cemetery. They will remain in their casket with flag draped and continue to be cared for by the funeral home staff until the time of the service. The dignified sheltering of veterans awaiting burial in our nation’s most sacred ground has been questioned in recent years and is a point of concern with many families. We are open to providing the families that we serve an opportunity to inspect the Hall of Heroes to ease any concerns that they may have in regards to the proper treatment of their loved one. Military honors are generally rendered as part of the graveside service at the cemetery prior to the interment of casketed or placement of cremated remains. Three representatives from the branch of service in which the veteran served will render the honors. One representative, a bugler, will play Taps while two other representatives are charged with folding the flag and presenting it to the next of kin.